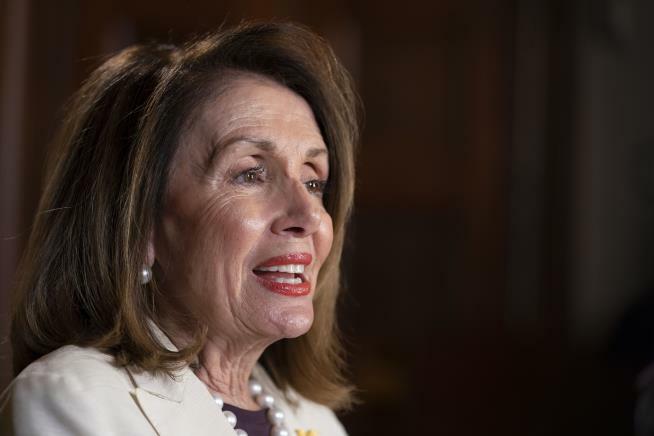 (Newser) – Nancy Pelosi appeared on 60 Minutes Sunday night, and she didn't have much good to say about President Trump. Among her lines: "There's nobody in the country who knows better that he should not be president of the United States than Donald Trump," she told Lesley Stahl. Trump took notice, deriding the "puff piece" and Pelosi ("her leadership has passed no meaningful legislation") in a tweet. "All they do is Investigate, as it turns out, crimes that they instigated & committed," he wrote. "The Mueller No Collusion decision wasn’t even discussed-and she was a disaster at W.H." Trump later ramped up his criticism not only of Pelosi but of Rep. Ilhan Omar—after Pelosi complained that Trump's attacks were putting Omar in physical danger. "Pelosi Disses Trump, and He Fires Back" Well, stop the presses. This sort of stuff happens only 2 or 3 times every week. She's a 2-faced hag, wrinkled with hypocrisy.